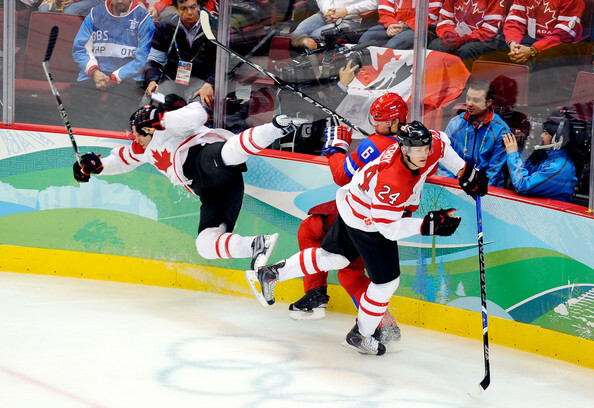 As was the case in Turin four years earlier, historical hockey rivals CANADA and RUSSIA were drawn to meet in the quarterfinal round at the 2010 Winter Olympics in Vancouver. The results this time around were quite different, indeed, if not downright shocking. In fact, by the time Canadian defenseman SHEA WEBER of the Nashville Predators had scored to open up a 6-1 lead four minutes into the second period, all this author had to say about the proceedings in Vancover was — Oh! Canada! RYAN GETZLAFF of the Anaheim Ducks triggered the offensive outburst with a goal for Canada just two and a half minutes into the game. San Jose Sharks rearguard DAN BOYLE, with a rush down the left that started in his own defensive zone, provided the crossing pass which left Getzlaff a gaping net to shoot at. Ten minutes later, with the man-advantage, Boyle circled in his own end to start a Canadian play which culminated with a wrist shot from the top of the left circle by the San Jose defender that beat his National Hockey League teammate, Russian goaltender EVGENY NABOKOV, to double Canada’s lead. Less than sixty seconds following Boyle’s goal, RICK NASH of the Columbus Blue Jackets changed the scoreboard to show 3-0 for Canada with not even thirteen minutes of the match played. Canada’s JONATHAN TOEWS of the Chicago Black Hawks and Philadelphia Flyers forward MIKE RICHARDS combined to strip Pittsburgh Penquins star forward EVGENY MALKIN of the puck at the Russian point. A smart pass from Richards sent Toews off on the counter, allowing the streaking Nash to put a puck over the stacked pads of Nabokov. Russia did attempt to revive themselves shortly thereafter. Defenseman DMITRI KALININ of Salavat Yulayev Ufa connected with a wrist shot from the left point past Canada’s starting goaltender, ROBERTO LUONGO of the Olympic host city’s Vancouver Canucks, roughly fourteen and a half minutes in. For Kalinin, the score was the product of what would be the Russian rearguard’s only official shot-on-goal the whole of the 2010 Winter Games tournament. But, whatever momentum Russia may have gained was lost on account of Canada’s BRENDEN MORROW with under two minutes to go in the opening period. At equal strength, the Dallas Stars forward secured a puck from Boyle along the boards behind the goalline and promptly skated out in front unchallenged. A backhander underneath Nabokov gave Canada a commanding 4-1 lead. The situation did not improve for Russia to start the second period. Three minutes after the intermission break, Canada became the beneficiaries of good fortune when COREY PERRY of the Anaheim Ducks found himself with the puck and a wide open net. Perry’s NHL teammate, Getzlaff, had gotten his wrist shot on the rush into the offensive zone deflected by Russian defenseman ILYA NIKULIN of Ak Bars Kazan with Nabokov out to cut the angle. Canada’s goal from Weber less than sixty seconds after Perry scored finally sent the San Jose Sharks goaltender to the showers for Russia. For Nabokov, the six goals allowed (on 23 shots) in twenty-four minutes at Vancouver stood in stark contrast to the shutout the 34-year-old had served up for Russia against Canada four years earlier in Italy. And so, Phoenix Coyotes goaltender ILYA BRYZGALOV was sent out by Russian coach VYACHESLAV BYKOV. A quick goal from MAXIM AFINOGENOV of the Atlanta Thrashers might have augmented any criticism of a belated decision by Bykov, but a second goal from Perry nine minutes into the second period certainly confirmed Canadian overall superiority on the night at Canada Hockey Place in Vancouver. 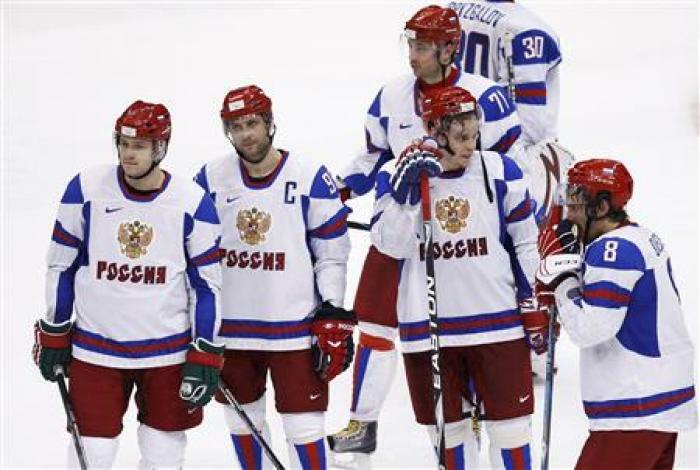 The CZECH REPUBLIC and RUSSIA renewed an old Eastern European rivalry at the 2010 Winter Olympics in a match that meant first place in the Group B standings to the winner in Vancouver. Powered by a pair of goals from EVGENY MALKIN of the Stanley Cup champion Pittsburgh Penquins, Russia defeated the Czech Republic 4-2 to claim the automatic berth in the quarterfinal round at the Vancouver Games. As Czech star JAROMIR JAGR of Russian club Avangard Omsk sat in the penalty box, Malkin and the Russian national team drew first blood on the power play fifteen minutes into the contest. A shot from the point produced a rebound for ALEXANDER OVECHKIN of the Washington Capitals, which was saved by Czech Republic goaltender TOMAS VOKOUN of the Florida Panthers. The loose puck in front soon kicked out to Malkin down low in the faceoff circle on the right wing. From the sharp angle on one knee, Malkin threaded the puck through Vokoun’s arm and midsection for a 1-0 Russia lead. The Czechs would tie the game with a power play goal of their own however, with less than a minute remaining in the opening period. After fine work by the Czechs in the offensive zone, specifically, by Czech captain PATRIK ELIAS of the New Jersey Devils and defenseman TOMAS KABERLE of the Toronto Maple Leafs at the point, Elias was able to hack the puck ahead to Montreal Canadiens forward TOMAS PLEKANEC. Plekanec collected the puck, spun around, and snapped a shot past Russian goaltender EVGENY NABOKOV of the San Jose Sharks, off the far post and into the net to square the score. For Plekanec, it was his third goal in three games for the Czech Republic at the 2010 Vancouver Games. Given the rich tradition and history of these two rival nations at the Winter Olympic, it should have come as no surprise the second period produced a tightly contested, close checking affair. The Czechs actually held a 9-7 advantage for shots-on-goal in the middle session, but it was the Russians who retook the lead with less than five and half minutes to go until intermission. Fashioning the goal for the Russians were a pair of players certainly familiar to national team coach VYACHESLAV BYKOV. ALEXANDER RADULOV, despite tight marking by Czech MARTIN ERAT of the Nashville Predators, was able to knock the puck forward to VIKTOR KOZLOV alone in the slot. Kozlov’s shot far post caught Vokoun moving the wrong way and sent the Russians back in front. Both Kozlov and Radulov, of course, compete for Salavat Yulayev Ufa, the Kontinental Hockey League club coached by Bykov. The goal that would decide the game came less two minutes into the third period and included the play of the day. Jagr, stickhandling at center ice, was caught with his head down and abolutely demolished by a devastating hit by Ovechkin. A quick pass from FYDOR TYUTIN of the Columbus Blue Jackets sent ALEXANDER SEMIN away with the puck down the left into the Czech zone until the Washington Capital backhanded a centering pass into space for Malkin steaming down the right. Malkin, again on one knee and, again, with a severe angle at the bottom of the faceoff circle, swept the puck past Vokoun for a critical two-goal advantage. The Czechs managed a game-high eleven shots in the third period and were able to draw within one with roughly five minutes remaining in the game. The play was made by MAREK ZIDLICKY of the Minnesota Wild; pinching in from the right point to collect a puck along the boards midway in the Czech zone, Zidlicky circled the net and fed MILAN MICHALEK of the Ottawa Senators standing in front. Michalek was easily able to one-time the puck into a virtually wide-open net for his first goal in Vancouver. The Czechs would press but, for the Russians, the danger would pass with an empty net goal from PAVEL DATSYUK of the Detroit Red Wings thirteen seconds from full time. For the all the offensive firepower fielded by the two rival nations, RUSSIA and SLOVAKIA, naturally, it was a classic goaltending duel which promptly ensued in the Group B match at the 2010 Winter Olympics in Vancouver. Slovakia’s JAROSLAV HALAK of the Montreal Canadiens, shaking off a lackluster first-game versus the Czech Republic, and Russia’s ILYA BRYZGALOV of the Phoenix Coyotes, making his first start at this year’s Olympic tournament, both stood out for their respective national teams. Halak halted 36 Russian shots while Bryzgalov brushed off 32 Slovak attempts to score in a match which required seven rounds in the penalty-shot shootout to determine a winner. Former Pittsburgh Penquins first round pick and veteran Russian international ALEXEI MOROZOV of Ak Bars Kazan profited from a deflected puck to score his second goal at the Vancouver Games five and a half minutes into the second period. Chicago Black Hawks star MARIAN HOSSA, however, pulled Slovakia level almost halfway through the third period after yeoman’s work from PAVOL DEMITRA. The shootout, befitting the match which had ensued, itself became a battle of the netminders. Slovakia’s aging JOSEF STUMPEL of Kazakh club Barys Astana in the Kontinental Hockey League started the shootout and promptly scored. Washington Capitals wing ALEXANDER OVECHKIN accounted for Russia’s only goal on his first attempt to square the score in the second round; five consecutive Russian failures versus Halak followed including those of Stanley Cup champions PAVEL DATSYUK and EVGENY MALKIN. Ovechkin ultimately took three of Russia’s first six shots for coach VYACHESLAV BYKOV’s squad. And so it was left for Vancouver Canucks veteran PAVOL DEMITRA to become the hometown hero. Goaltender ILYA BRYZGALOV (30) of the Phoenix Coyotes as well as Salavat Yulayev Ufa defenseman DMITRI KALININ are two players Russian coach VYACHESLAV BYKOV will count on to help implement a Russian Restoration for ice hockey at the Winter Olympic Games. The national team of the old Union of Soviet Socialist Republics, if one adds the so-called Unified Team of the 1992 Albertville Games, entered ten ice hockey competitions at the Winter Olympics and won eight of those tournaments. From 1956 to 1992, the USSR contested 70 ice hockey matches at the Winter Games and won 62 with two draws. The Soviet Union also never failed to medal having collected one silver and one bronze in addition to the eight Olympic gold medals. Players such as goaltender VLADISLAV TRETIAK, defenseman ALEXANDER RAGULIN and forward ANATOLI FIRSOV piled up as many as three titles for a career at the Winter Games. Russia, meanwhile, since their first appearance at the 1994 Lillehammer Games, have never won the Olympic ice hockey championship. The Russians, who have failed to medal twice at the Olympics, can only show a solitary silver and bronze from their participation at the Winter Games thus far. Russian coach VYACHESLAV BYKOV, himself a two-time Olympic champion from both the Calgary and Albertville Games, respectively, has certain expectations, however, as do the people of a nation with such a rich tradition of success. Washington Capitals winger ALEXANDER OVECHKIN and Ak Bars Kazan attacker DANIS ZARIPOV each scored two goals to spearhead an assault in which Russia overwhelmed Latvia 8-2 on opening day at the ice hockey tournament for the 2010 Winter Games in Vancouver. Zaripov started the Russians’ goal parade barely two and a half minutes into the match. Nashville Predators defector and current Salavat Yulayev Ufa stud ALEXANDER RADULOV deposited another puck into Latvia’s cage with game not yet eight minutes old. And, Ovechkin opened his account at this year’s Olympics at the end of a first period in which Russia took 19 shots at Latvia’s besieged goalie EDGARS MASALSKIS. Masalskis did manage to stop the bleeding for a bit but Pittsburgh Penquin EVGENY MALKIN put Russia 4-0 on the power play with less one hundred twenty seconds left in the second stanza. 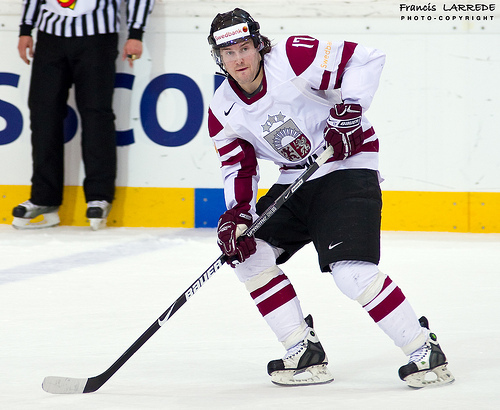 Veteran HERBERTS VASILJEVS of German club EV Krefeld lifted Latvia with a goal 33 seconds into the third, but the Russians, unfortunately for the Baltic representatives, responded immediately with three goals in little more than two minutes to put the result beyond all doubt. Ovechkin, Zaripov and New Jersey Devil ILYA KOVALCHUK were the culprits. GIRTS ANKIPANS replied for Latvia shortly thereafter to cap a pinball-like three and a half minutes to start the final period; 33-year-old birthday boy and Ak Bars Kazan veteran ALEXEI MOROZOV, once a first round pick of the Pittsburgh Penquins in 1995, closed the books at 18:57 to set the final score at 8-2 for Russia. The Russian Bear appears hungry. Ovechkin’s pair of strikes pushes his total to 27 for Russia at major international tournaments with Kovalchuk now right behind on 26 goals; both players trail Russia’s all-time goal-scoring leader, ALEXEI YASHIN, who sets the pace with 30 goals. 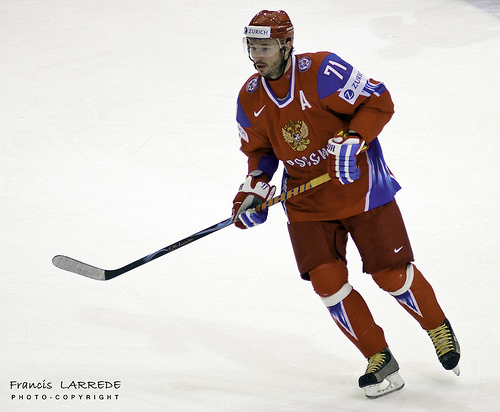 ILYA KOVALCHUK (71), recently traded from the Atlanta Thrashers to the New Jersey Devils in the National Hockey League, will be looking to help Russia lift its first-ever Olympic championship. Kovalchuk (25 go, 52 pts) stands in second on Russia's all-time chart, five points behind Alexei Yashin, for scoring at major international tournaments. The Russians under coach VYACHESLAV BYKOV, the skipper of Kontinental Hockey League side Salavat Yulayev Ufa, made no changes to their formidable roster. 33-year-old ALEKSANDRS NIZIVIJS of Dynamo Riga is Latvia's leading scorer (15 go 25 as, 40 pts) all-time at major international tournaments. ALEXANDER OVECHKIN (8) opens the scoring for Russia in the third period of the quarterfinals against Canada at the 2006 Winter Olympics in Italy. 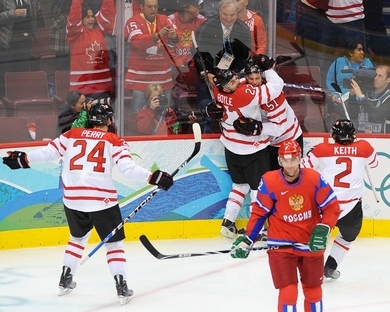 Russia blanked Canada 2-0. Ovechkin, obviously expected to be a big contributor for the Russian Olympic squad in Vancouver next month, currently occupies second in the NHL scoring race with 62 points and stands third with 29 goals in 39 games for Washington this winter. Two Czechs, TOMAS FLEISCHMANN of the Capitals and TOMAS KABERLE of the Toronto Maple Leafs each collected a goal in the contest; the Czech Republic and Russia are slated to face-off February 21 in Group B round-robin play at the Vancouver Games. MIKE KNUBLE, an Olympian for the United States at Turin in 2006, tallied two goals for Washington. Knuble, 37, was not selected for the U.S. squad ths go around. Russian defenseman ANDREI MARKOV (52), left, signals his second period goal against United States netminder ROBERT ESCHE as MAXIM SUSHINSKY (33) and PAVEL DATSYUK (13) look on at the 2006 Winter Olympic Games in Turin, Italy. Russia defeated the United States 5-4 in the round-robin. Markov, meanwhile, has three goals and four points his first three games back for the Montreal Canadiens after a lengthy spell on the injury list. NOTE — Fedorov’s international tournament appearances and games include totals from the former Soviet Union. The one noteworthy casualty who was a holdover from the 2006 Winter Olympic squad would be Los Angeles Kings left wing ALEXANDER FROLOV. One surprise has to be the selection of defenseman KONSTANTIN KORNEYEV of CSKA Moscow ahead of some older, more experienced internationals in the Kontinental Hockey League. Korneyev is a 2002 Montreal Canadiens’ 9th round draft pick (# 235 overall) who has spent his entire career in Russia thus far. The 25-year-old rearguard has 5 goals and 16 points with a + 12 rating from 36 games for mid-table CSKA Moscow of the KHL. VIKTOR KOZLOV, who plays for Russia national team coach VYACHESLAV BYKOV with Salavat Yulayev Ufa in the KHL, not only brings outstanding size for Russia, the veteran left wing/center was teammates with SERGEI FEDOROV, ALEXANDER OVECHKIN and ALEXANDER SEMIN with the Washington Capitals in the National Hockey League last season. Kozlov, who registered 13 goals and 41 points in 67 games for the Capitals last year, currently has eight goals and 20 points from 37 games for Salavat Yulayev, who are at present third overall in the 24-team KHL circuit. Russia's ILYA KOVALCHUK (71) stuffs the puck past Latvia goaltender ARTURS IRBE to the chagrin of defenseman KRISJANIS REDLIHS (25) in the round-robin at the 2006 Winter Olympics in Turin. Kovalchuk's second goal of the first period, here, gives Russia a 3-1 lead on their way to a 9-2 romp. In all, Kovalchuk totaled four goals for the contest. NOTE — Asterisk indicates player competed for the national team of the former Soviet Union and / or the “Unified Team” at major international event(s); totals here are for Russia, only.